Ferrite tile absorbers are useful over the frequency range 30MHz to 1GHz, however the performance deteriorates quickly above 1GHz. Ferrite tiles can be supplied individually (measuring 100mm square and 6.7mm thick) or glued to MDF panels 600mm square. 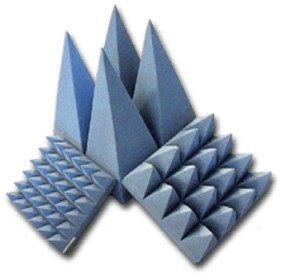 Pyramidal Foam absorber can be utilised for the frequency range 100MHz to 40GHz. The factor determining the lowest useable frequency is the physical size of the foam pyramid. The larger the dimensions of the pyramid, the lower the frequency of operation. Due to the volume consumed within an anechoic enclosure when using large pyramidal foam. Ferrite Tiles are often overlaid with smaller Pyramidal Foam absorber to extend the anechoic performance down to 30MHz without losing valuable space. Polyurethane foam loaded with carbon (and fire retardant) can be supplied in various dimensions. An additional matching layer can also be applied to the base for impedance matching when installed over ferrite tiles.